A quality outdoor deck enhances a backyard by providing an ideal space for family and friends to congregate and enjoy the outdoors. 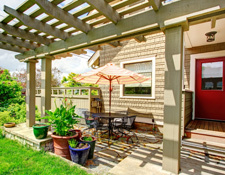 Decks are the perfect sites for barbeques, outdoor dining, or afternoon lounging. Sears Handyman services offers both deck construction and deck repair services, which means we can start a new project from scratch or replace decking and railings on an existing deck framework. 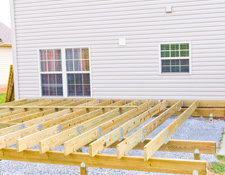 Building a deck involves several intricate steps, and if there’s a mistake at any point in the process, the deck could have a serious deficiency that requires it to be dismantled and constructed all over again. These steps include installing footings to serve as the foundation of your deck, ledgers to fix the deck to your home, framing to provide the structure, decking for the floorboards, and the addition of any railing or stairways the architecture of your house might need to complete the project. Needless to say, building a deck can be a demanding process, and many homeowners lack the time to gather the necessary materials, learn the details of deck building, and complete the process on their own. 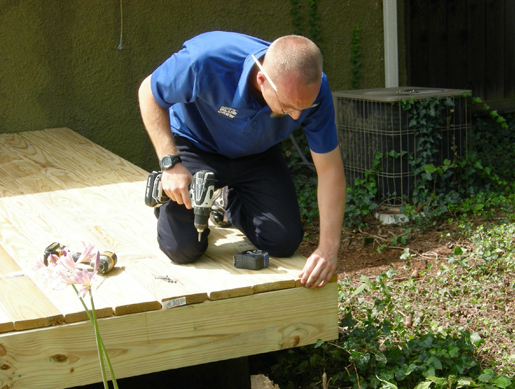 Instead, many opt to hire a professional to handle the hard parts of deck building. For excellent craftsmanship at affordable prices, you can rely on Sears Handyman Services. Our staff of skilled handyman technicians can discuss deck options with you, including sizing, styles, and preferred materials. Step by step, you’ll be a part of the process to ensure you get the deck you want. Once you have chosen your design and materials, the Sears Handyman staff will execute the design by properly installing and building your deck, piece by piece. With Sears Handyman Services, you’ll get great service from local professionals from one of American’s most trusted names in home improvement. Composite decking is decking material made from substances other than wood. Composite decking is available in several materials and its boards come in several colors and styles. Some homeowners prefer composite decking so they don’t have to stain or treat their wood deck periodically throughout the year, or worry about wood rot. 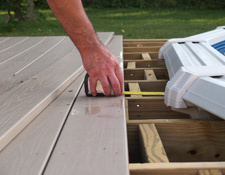 For more information on composite decking installation and pricing, call a Sears Handyman representative. Gazebos are decorative outdoor enclosures that provide a screened-in, sheltered space so you can sit and enjoy the outdoors while protected from bugs and the sun. Available in a variety of styles, a gazebo can add a significant new element to your backyard. For discussion of gazebo building and pricing options, call your local Sears Handyman specialist today. A pergola provides an attractive structure that creates shade and a natural space for lounging outdoors. Many homeowners decorate their pergola with drapes and plants for added appeal. Constructing a pergola involves craftsmanship and carpentry skills. 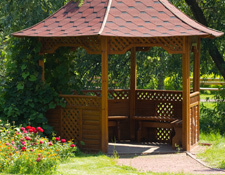 If you’d like more information on pergola building for your yard, you can contact a Sears Handyman professional today.